Last week's rumors of a Wii Mini console have turned out to be true. However, it seems the slimmer console will not be available in most parts of the world for this holiday season. The Wii Mini has a smaller case with a red and black case. 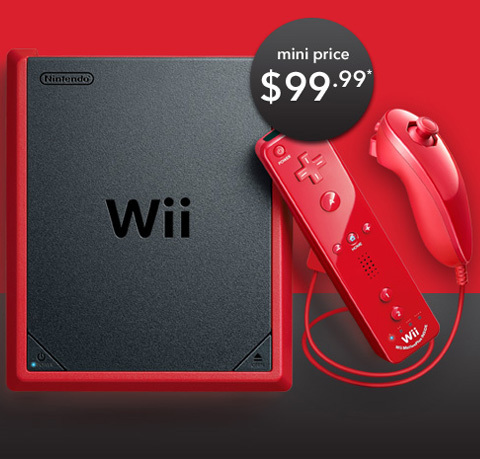 It also comes with a matching Wii Remote Plus and red Nunchuk. It's priced at $99.99. Nintendo made it smaller and cheaper by axing a couple features. The Wii Mini can't play Nintendo GameCube games. Furthermore, it doesn't have any Internet capabilities. "There are games in the Wii library for every type of player,” said Ron Bertram, VP and GM of Nintendo of Canada. "Wii Mini is a great gift for the holidays that brings everyone in the family together to play. Wii Mini has a mini price, but it’s all about big fun." The Wii Mini will arrive in Canada on December 7th. That's the only country receiving it this holiday season. Nintendo hasn't announced whether or not it will come to other territories yet. It's possible they're using the Canadian launch as a test. If it sells well, I suspect we'll see this new model in other countries as well.